Many candle makers want to learn more about how to make fancy candles. Creating unusual and different candles is an interesting and intriguing way to develop the craft of candle making. Candle making is such a versatile craft. Candle makers can quickly make plain and simple candles that look great and are perfect for putting into decorative candle holders. They can carefully craft candles that are works of art in their own right. Some candle makers enjoy the control that they have over the candles that they produce, perhaps specializing in making natural candles, where others concentrate on the design and visual aspect of candles. This wide and diverse nature of the craft is what attracts people to learn candle making skills. Whatever a candle maker's interest, however, there is likely a time when they want to learn more about how to make fancy candles. The color of candles varies from white to deep and dark shades. Candle makers can easily transform the color of wax by introducing special candle dyes. These dyes are formulated for use with wax and are highly concentrated to give deep and vibrant shades if required. Candle dyes do not dilute the wax and are suitable for use at high temperatures. Many fancy candles can be created using coloring. 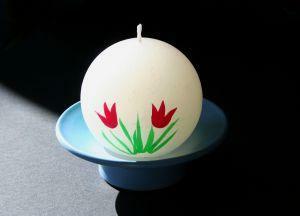 Special colorants such as neon shades or glow-in-the-dark dyes can make highly unusual candles. The type of fragrance used in a candle can turn it from being a basic light source into a beautifully scented candle. Many candle makers, when exploring how to make fancy candles, make creative use of fragrances. There are a number of ways of making fancy candles using fragrances. These include blending fragrances to make unusual and unique scents or even using some ready made contemporary fragrances. Some highly individual synthetically produced candle fragrances are bubble gum, freshly cut grass and baby powder. These can help make a candle really special. It is important to use fragrances that have been designed for use with candles. Normal fragrance oils may spoil the way that a candle burns or even become flammable at low temperatures. Candle fragrance oils are available from craft stores and specialist candle making supplies. Depending on the type of candle, decorations can be added to the surface or included within the main body of the candle. Creative use of this type of decoration is an effective way of making fancy candles. Some well placed ribbon, lace or glittery fabric can give added glamour to a candle whereas fancy embeds can transform a plain gel candle into a stunning room accessory. Many special embellishments and embeds are available from candle supply stores. These types of embellishments are designed to work with a range of waxes and different candle types. It is important to take the advice of a candle making supplies vendor when picking embeds to use or embellishments to add as they will be able to suggest products that will work with different waxes. Unusual shaped molds are a great way to make unusual candles. Candle makers wondering how to make fancy candles often use molds to help make their candles different. There are a wide range of sizes and shapes available. Fancy molds include very ornate shapes such as flowers, figures and even cakes. Fancy candles are great fun to make because they give candle makers the opportunity to enjoy exploring their creativity. These candles make lovely gifts for family and friends, as well as being great items to sell at craft fares. Try creating some of your own original designs, and share your talent with everyone.